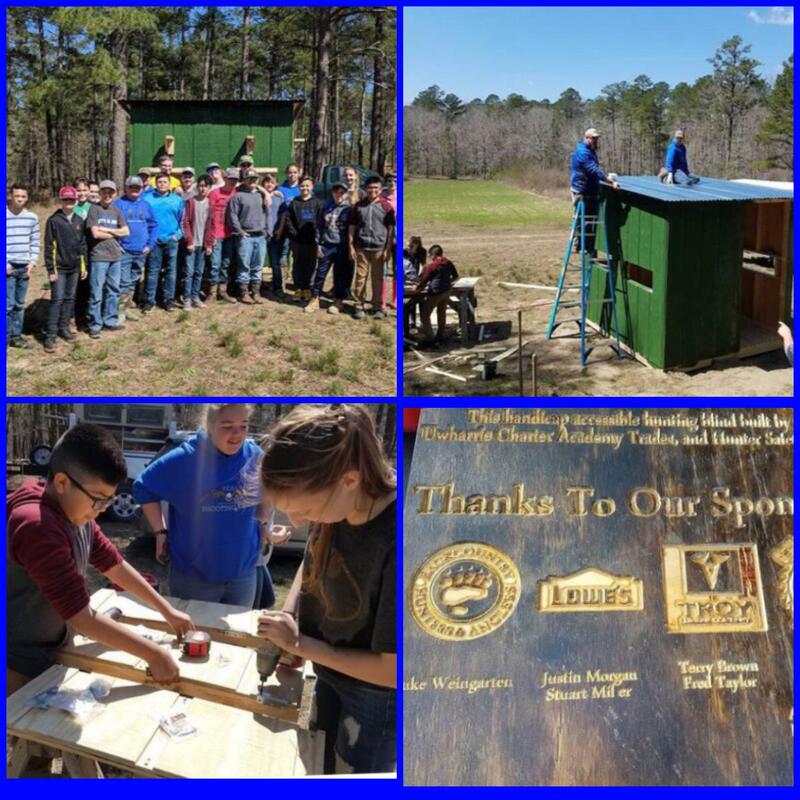 Sixth, seventh and eighth grade students at the Uwharrie Charter Academy Middle School recently collaborated with the North Carolina Wildlife Resources Commission and Backcountry Hunters & Anglers to plan, design and assemble a handicap accessible deer hunting blind. It was constructed with the aid of woodworking teacher Obie O’Brien, seventh grade social studies teacher J.D. Goodwin and Ian Thomsen, who teaches Trades and Hunter Safety Classes at UCA. The deer hunting blind is equipped with handrails, a ramp and enough space for a wheelchair to easily fit inside. It is located at Sandhills Gamelands in Hoffman, a 60,000-acre nature reserve where people may hike, hunt, fish and bike. With the help of their teachers, students built each part of the hunting blind piece by piece for it to be transported to Sandhills and assembled, which happened on Friday. Goodwin said the N.C. Wildlife Resources Commission helped to provide the students with a place for the hunting blind, and coordinated with Sandhills in order to have it serve as an educational opportunity and field trip for the students. Goodwin has aspirations of providing students with similar learning opportunities in the future by creating other hunting blinds, such as turkey hunting blinds and duck hunting blinds. Assembly and structure materials for the blind were provided through fundraisers and donations from local vendors, as well as sponsored by Backcountry Hunters & Anglers, Lowe’s Hardware Improvement and Troy Lumber Company. O’Brien said his students have created a number of items through woodwork, including cabinets, benches, lanterns and name plaques. Some UCA students who worked hand-in-hand with creating the hunting blind shared their thoughts on the project. 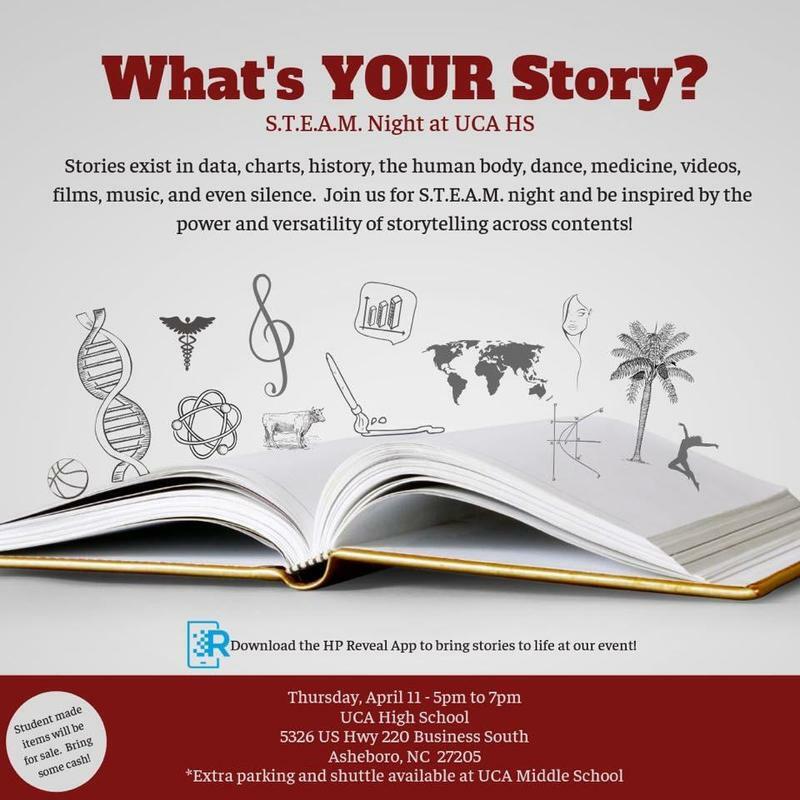 Tomorrow is STEAM NIGHT! "What's Your Story" is this spring's theme. This event will be filled with all kinds of performances, roller coaster and catapult models, Trashion Show, 5' DNA models, wax museum, a journey to Mars, futuristic cities, bilingual storytelling for children, designing own restaurant, developing small business, planning the great American road trip and so many more to list. Families with small children: There will be story reading and children's book give away while supplies last. There will be children's crafts provided in the art room where children can create story bags to take with them. We would like to welcome families and friends to come see what our high school students are learning in the classroom. When you arrive on campus please be sure to pick up a map. As you navigate through the building, please feel free to use any of the exterior doors to get from wing to wing. This will help with overcrowding within the building. **Parking** Please park in parking spaces ONLY. DO NOT PARK ON ANY GRASSY AREAS DO NOT PARK ALONG THE ROAD IN FRONT OF THE SCHOOL DO NOT PARK IN ANY DRIVING LANES Once the parking lot is full traffic will be directed to park at the middle school and a shuttle bus will run between both campuses. Congratulations to UCA 8th grader, Eleanor Shropshire-Smith. 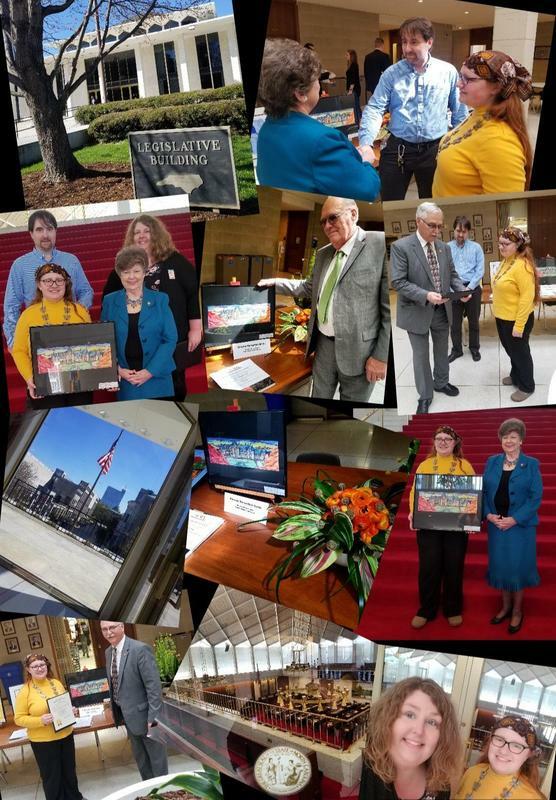 She was recognized as 1 of 16 students that will have their artwork hanging year round in the passage way between the General Assembly building and NCDPI in Raleigh. Randolph Co. Representatives: Pat Hurley, Allen McNeill, and Senator Jerry Tillman stopped by to meet Eleanor and view her work. Eleanor and her family also got a great history lesson upstairs as they looked down into the House and Senate. The red carpet was also opened for them to take photos .....which apparently they only do for very special occasions. Eleanor was presented with a sketchbook and certificate. Her work was framed for hanging and on display for everyone enjoy. UCA is very proud of your awesome work! PAWSitive Pups Steam Class organized a Pet Food Drive for dogs and cats of Randolph County! Food donated went to support the Randolph County SPCA in filling their pet pantry. The SPCA pet pantry provides temporary assistance for Randolph County residents in feeding their pets and supplies food for the feral cat colonies that are part of the Trap-Neuter-Return program. 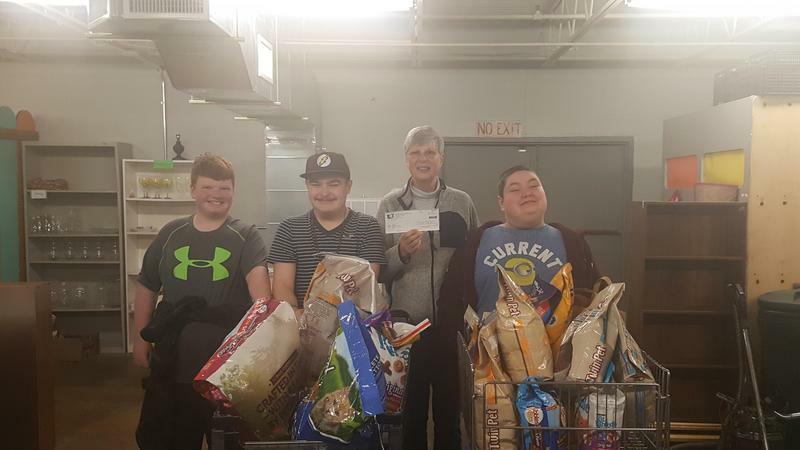 PAWSitive Pups delivered the dog and cat food to the RCSPCA and donated $50 on Flex Day, Friday, March 22nd. Thank you to those that donated to the pet food drive! !